American Sign Language interpretation is offered, September through May, on the 2nd & 4th Sundays of the month. 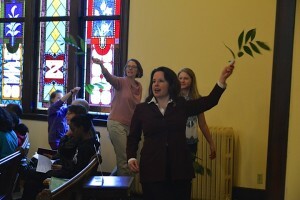 At 10:30 a.m., people of all ages come together in the sanctuary for worship. Children are very welcome. 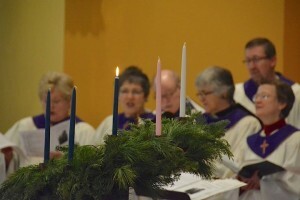 Our services are composed of instrumental music, singing, spoken word, silence, prayer—as well as some surprises! We follow a basic pattern of worship but strive to include new and creative ideas that engage the heart, mind, and soul. We seek to use language to describe God and The Sacred that is expansive, inclusive, and poetic. 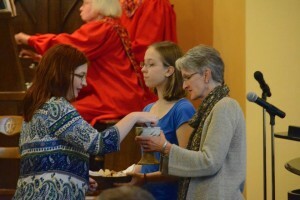 First UCC celebrates Holy Communion (also known as the Lord’s Supper or the Eucharist) on the first Sunday of every month at 10:30 a.m. worship. We believe that God invites all people to the table; everyone is welcome to participate, including children. You need not be a member of this or any other church. We celebrate by intinction, meaning that the people come forward to receive the bread and dip it in the cup. In a spirit of inclusiveness, our cup is alcohol-free grape juice and our bread includes a gluten-free option. Communion is completely voluntary; you are welcome to remain in your seat and observe. In general, as a community, we believe that the bread and cup are living symbols of the present, past, and future redeeming life of Jesus Christ.